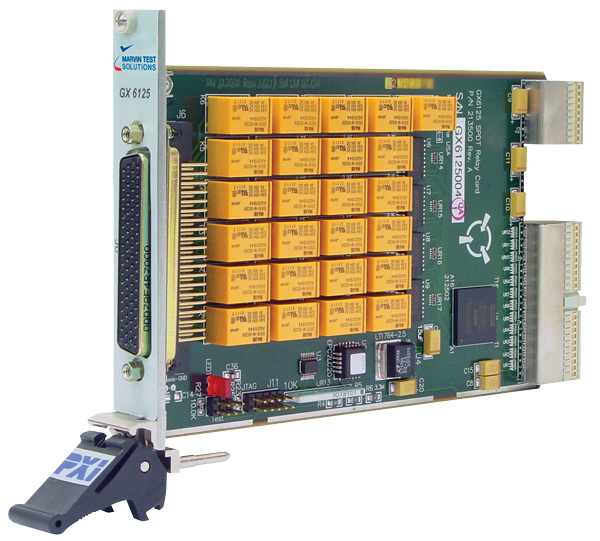 PXI Switching, General Purpose Card - GX6125 | Marvin Test Solutions, Inc. The GX6125 is 3U high density switching card with 25 SPDT Form C relays with a switching power rating of 60 W. The GX6125 is suitable for all test applications requiring general purpose, low level switching. The GX6125 has 25 SPDT relays and a 78-pin D type connector which makes it easy to connect to the UUT or test system interface. Each of the relays can be latched or unlatched under program control. Connections 78-pin D Sub-type connector. Includes mating connector.